Over recent months I had clocked that the Wee Black Dug was not quite as indefatigable when it came to Munro bagging as she used to be. After a good 6 hour walk, when she jumped out of the car at the end of the trip home, there was definite evidence of...slight hirpling. The day after her most recent summit success - Creise et al - she sort of went proper lame for half an hour. Thorough examination over, Ken the Vet opined that it was probably earlyish arthritis in her "elbow" joints. She'd need X rays to be sure, and to see how advanced it was, but that was the most likely thing. Fit dog she was, but it was possible her boundless enthusiasm for running, leaping, frisbee-catching, rabbit-chasing and general hundred mile an hour life-embracing was taking its toll on her joints. "And another thing." he added. "She's been a steady 25kg in weight since she was a youth. She's now 27kg. Regardless of what the X rays show, you need to get some of that off her." You could almost see the panic in the dug's eyes when she heard that. I mean, she likes hillwalking, but she ****ing loves her food. Further tests, as they say, confirmed the original diagnosis. And, with elegant inevitability, the commencement of The Diet. Just to add to the sum total of misery, poor Molly was collateral damage, because if Jorja was to be on half portions it was only fair, sensible, right and just that her less active big sister should have to join in the fun. As to the thorny question of exercise - generally a recommended part of a weight-loss attempt - the WBD had to be largely rested, so it was a case of 5 minutes on the lead twice a day for the first wee while, then onto 10, then...well you get the gist. "Treat the recovery like you would if it was yourself" Ken had told me. If she shows signs of starting to limp again, you'll need to rein it back in". Upshot is, since September, the dug has stoically accepted her rations and is now about 24kg. (Terrifyingly, her target, ideally, is 22.) 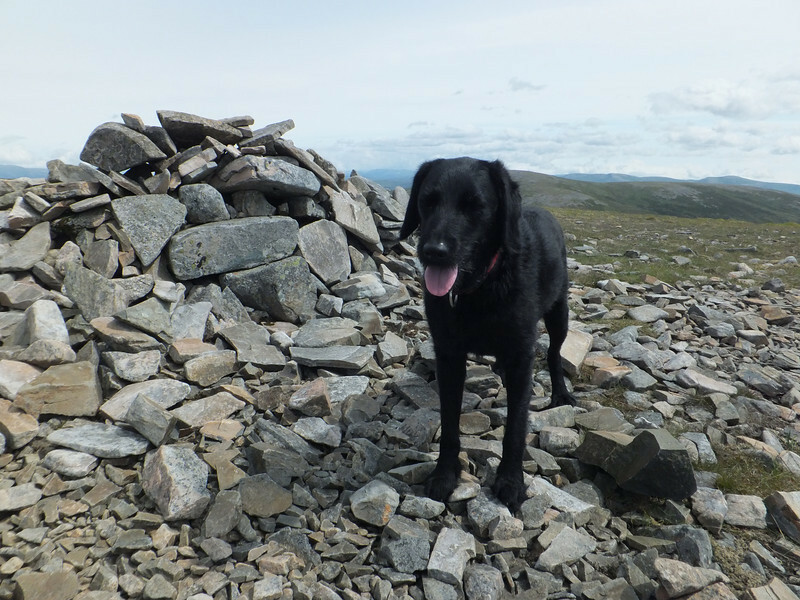 We're up to about 3 miles a day now on the leadwalking campaign, with no ill effects thus far, and on that basis, accordingly, we reach the point of this increasingly rare blogpost, which is the Wee Black Dug's return to a hill! Now, I'll give you that it was by no means a Munro, and it's one she's done plenty of times before, but given where we were - and what we weighed, and how we limped - a few weeks ago, I'm a happy camper. I'm also a very drookit camper, because it was truly horrible up there the day, but it was a means to an end. Just to end on a bit of perspective, the Meikle Bin round trip is a tad over 6 miles. Here's the heroine of the story a wee while back, at the furthest-from-the-car-point of a 26-miler.